Italians have a saying, “Mangia bene, ridi spesso, ama molto”—Eat well, laugh often, love much. 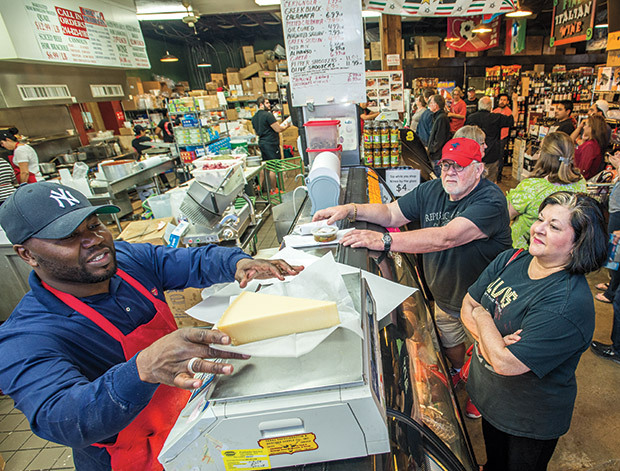 This approach to life also sums up the 50-year history of Jimmy’s Food Store in east Dallas, where an extensive inventory of Italian foods and attentive customer service spearheaded by owners Mike and Paul DiCarlo make each customer feel like part of the family. Located northeast of downtown, just a few miles east of Central Expressway, the store is easy to spot: Just look for the awning sporting the red, white, and green colors of the Italian flag. Jimmy’s Food Store is at 4901 Bryan St. in Dallas. Hours: Mon-Sat 9 a.m.-7:30 p.m. Call 214/823-6180. Currently celebrating its 50th anniversary, this small Italian market enjoys a cult following of Dallas “Italianphiles” who adore the offerings of this long-standing mom-and-pop grocery. There is so much packed into the store’s five narrow aisles that it’s sometimes difficult to know where to start. Flags representing the 20 regions of Italy hang from the rafters, and on the shelves you’ll find hundreds of imported Italian products and more than 300 varieties of Italian wine. There are multiple brands of coveted San Marzano tomatoes, bags of dried pasta in dozens of shapes, cans of oil-packed tuna, jars of Italian preserves, and a freezer case filled with imported pizza dough, handmade pastas, gelato, and cannoli cream filling. On my first visit to Jimmy’s in 2010, I had recently returned from living in Italy and longed for the Italian flavors I had come to enjoy. Many hard-to-find ingredients made favorite recipes impossible to cook, and I’d given up my stateside search for small-production southern Italian wines like Aglianico or Falanghina. After exploring the store and meeting the DiCarlo family, I discovered that Jimmy’s vastly exceeded my expectations. Their inventory and hospitality reminded me of shopping in Italy at the quaint family-run markets in the town square. Over the store’s 50 years, it has evolved from a neighborhood grocery to an Italian specialty food store. Vincent DiCarlo and his son James (aka Jimmy) started working together in the grocery business in south Dallas in the 1940s, but in 1966 decided to open a shop in a more central location. At first, the Thai and Cuban housing projects in the neighborhood dictated an inventory of global products. As the neighborhood continued to evolve, so did the clientele and inventory. In the late 1990s, the DiCarlo family was inspired by their heritage to become an Italian specialty food store. Mike and Paul have worked in the store for as long as they can remember, and they managed it with their father until his passing in 2013. When the family decided to focus on products from Italy, Mike turned to New York City to find suppliers, and Paul began traveling abroad to learn more about Italian wine. Their mother, Marie, started rolling her own meatballs, making Italian sausage, and preparing other family recipes. (Marie passed away in 2005, but meatballs and sausages made according to her recipe are still some of the shop’s most popular items, and more than 30 Dallas restaurants serve the sausages on their menus, as well.) Mike and Paul’s sister, Mary Martha, eventually joined the team to make desserts like Italian cream cake, cannoli, cookies, and tiramisu. Over the years, they’ve added Italian deli items, handmade pizza, lasagna, and made-to-order sandwiches. After a fire destroyed the interior of Jimmy’s in 2004, the DiCarlos picked up the pieces and reopened with even more Italian products, a larger selection of Italian wines, and, eventually, a wine room called Circolo del Vino. Tastings at the store take place every Saturday from 11-4, and bi-monthly wine dinners here feature a visiting Italian winemaker serving wines to complement a multi-course, Italian menu. A recent event featured wines from Masi Agricola, a famous winery in Veneto that has been owned by the same family since 1772. A member of the family presented the wines, and Italian chef Tommaso Lestingi, who lives in the Dallas area, created a pairing menu featuring seared scallops in a truffle sauce, porcini risotto, seared beef tenderloin with foie gras, and a cheese course with fig chutney. The dinners have a loyal following and usually sell out within hours of being advertised. During the day, Jimmy’s is popular with the downtown lunch crowd, who flock to east Dallas for Italian sandwiches made at the deli counter. On average, Jimmy’s sells 2,000 sandwiches a week from a menu that includes Italian subs, muffulettas, prosciutto panini, and assorted salads. Despite the store’s small size, I always manage to spend an hour or two on every visit. I enjoy discovering new Italian products, browsing the wine racks, and admiring all the cheeses, meats, and olives that fill the deli counter. I’m always inspired to try something I hadn’t noticed before—a can of eggplant caponata, a bottle of Nero d’Avola wine from Sicily, thinly sliced beef to make braciole, or chocolate-covered torrone spiked with amaretto. As I approach the register with my coveted Italian purchases, I always think how lucky we are to have a destination like Jimmy’s Food Store offering a tiny slice of Italian heaven right here in Texas. Arrivederci, Jimmy’s—or until my Italian cravings strike again.